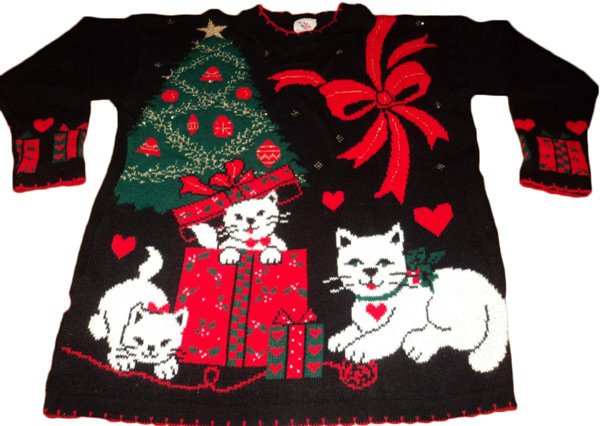 Every December, people of all stripes make the rounds of their neighborhood Christmas parties decked in their ugliest Christmas sweaters (see our list for 2012 here). Prizes are often offered at these seasonal soirees for the tackiest v-neck or wool knit, sparking fierce competition among family and friends. 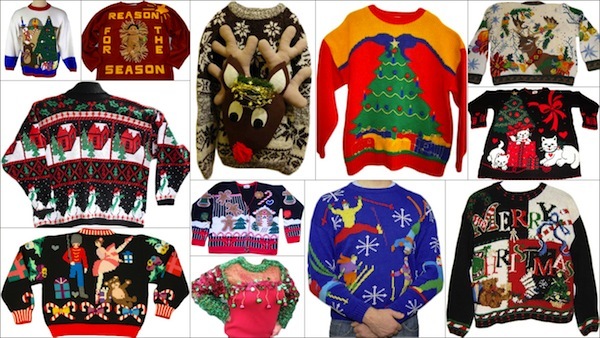 If you haven’t snagged your piece of atrocious holiday outerwear yet, we know where you can glory in the gaudy, revel in the revolting, and win that coveted prize: our ugly Christmas sweaters page. In honor of the 12 days of Christmas, we’ve ranked our favorites from best to worst (or is it the other way around?). So pop a dramamine, sit back, and enjoy. 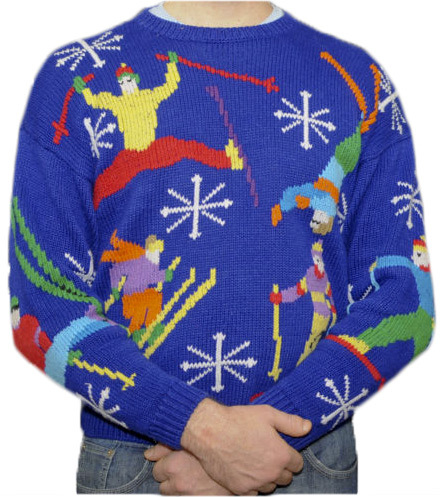 Some are still for sale, but hurry: with looks this ugly, these sweaters won’t last. 12. 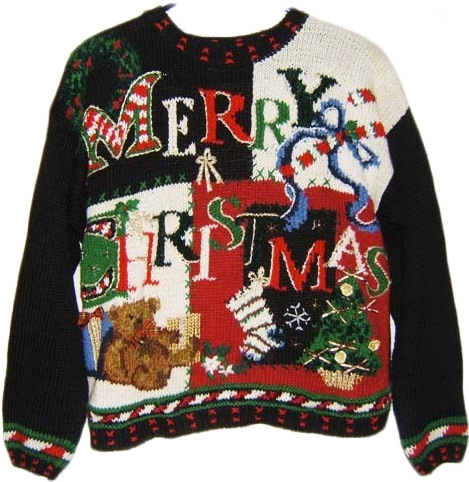 One of the hallmarks of a truly ugly Christmas sweater is three-dimensionality. 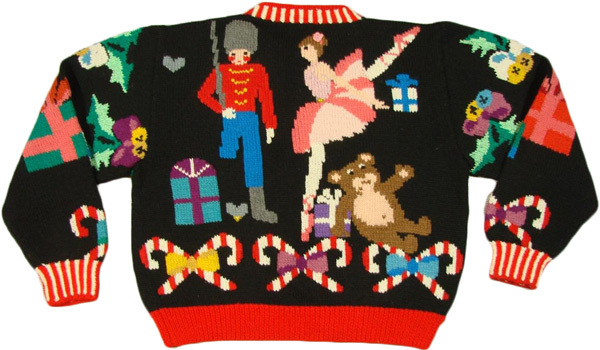 In the case of this vaguely patriotic 1980s beauty from Bravo, bows, beads, pom poms, and fabric candy canes protrude from the sweater’s acrylic knit surface. If only that mantel clock actually worked. 11. Here’s a handsome blue crewneck from Traditional Trading Co. that signals your holiday spirit and fondness for skiing, even if that means occasionally doing so upside down. Apparently, snowboarders know better than to wear a garment as tacky as this. 10. Awww. What could be cuter than fluffy white kittens playing with a ball of ribbon and an open Christmas box? How about anything. 9. This mock turtleneck from Cabin Creek proves that even the most innocuous imagery (a snowman in a hat, and cabin in the woods) can get deliciously ugly when it’s repeated enough. 8. Hillary and Paige is the company that’s blamed for this extra-large acrylic knit billboard. The tree is accented with pom poms, and that’s real fake gold stitching on the gifts. 7. This Berek from the 1980s teeters into ugly land because its imagery is so saccharin, and if it causes you to get Tchaikovsky stuck in your head, all the better. 6. Another Berek cardigan: not advised for wearing out of doors during hunting season. 5. It’s got gingerbread buttons, a gingerbread house, and gingerbread men floating into the sky. We’re hungry. 4. This fashion catastrophe from Tiara International has a nice balance of ugly and traditional style. Gotta love all that black; so cheerful for the holidays. 3. 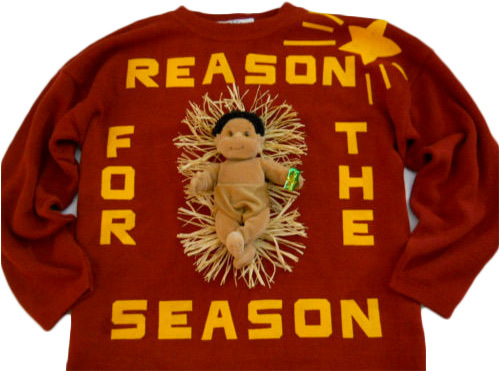 This is what the Christmas is all about: a three-dimensional “Baby J” doll on the front of a maroon sweater, surrounded by text and a star that’s all weirdly similar to graphics used on propaganda posters in the old Soviet Union. Be careful not to impale your loved ones on the spikes of straw when you give them that seasons-greetings hug. 2. 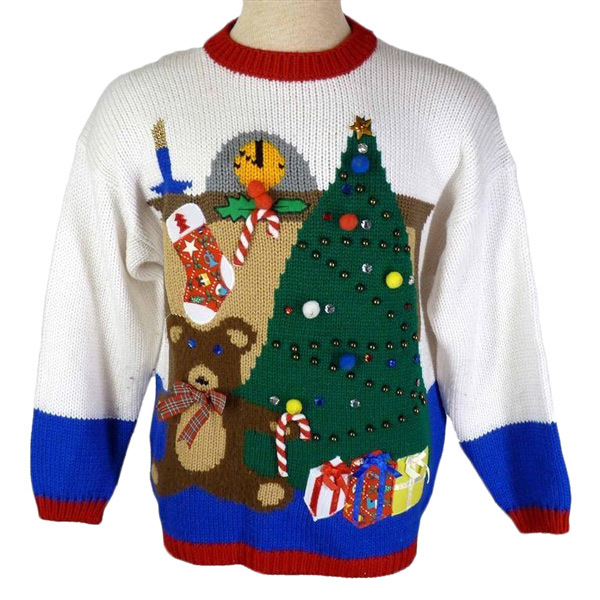 Perhaps the most important genre within the ugly Christmas sweater universe is the mildly ugly sweater that’s been upgraded to resoundingly tacky by attaching stuff to it. 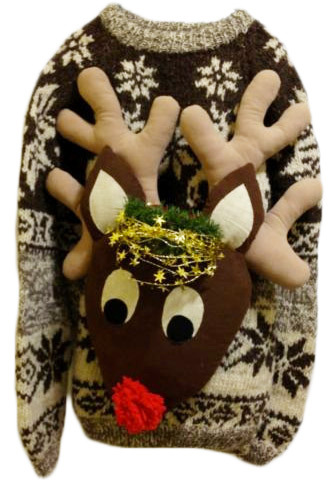 In this case, a red-nosed reindeer with a crown of stars surrounding a clump of what appears to be Astro-Turf will buldge from the belly of whoever is crazy enough to wear this wool nightmare. 1. Finally, this testament to tinsel has everything: gold mesh, garlands galore, green and red bells dangling from the chest, lights, and it even plays “Jingle Bells,” as if it’s visuals weren’t already loud enough. Congratulations! #1 SOLD FOR $91.00 on Ebay. Wow!!! Where do you find these??????? 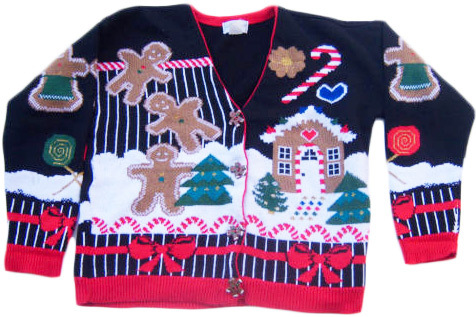 My boyfriend and me have been searching so hard for an ugly christmas sweater! #3 is the best (worst) one. 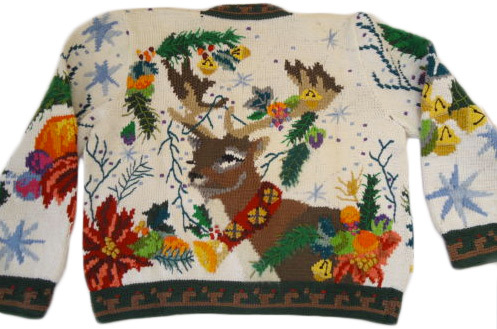 If you are interested in finding ugly holiday sweaters, go to you local Good Will store. Trust me, they will have what you want. These young men have been on national TV and they also have a book on the subject. This website definitely has the best selection of sweaters, (and I’m not saying this because one of the young men is a former student of mine). Sorry, Deirdre, but #7 is not The Steadfast Tin Soldier. It’s The Nutcracker. Perhaps the greatest thing about 7 is that apparently the person who made it never read the fairytale or saw the ballet. Or at least while sober? Angie, look closer at the soldier. Please note the incomplete leg, and the tin heart. Funny! But i think it’s nice! It really suits for the kids and besides its a holiday season. Christmas is all about giving and loving. Well, it shows on the sweaters. it is colorful as the day our Savior was born. ROTFL! I love this page. Thank you for making me laugh out loud and for seeing the lighter side of this shopping extravaganza. I need to get one in hopes that it makes others laugh, like you have made me laugh today. Question – Do you secretly own them all? And which one will you wear this Christmas? Deirdre is correct, that is from the tale of the Steadfast Tin Soldier. I would wear the cat one. Wow! There are so many cute Christmas sweaters! I love them very much! 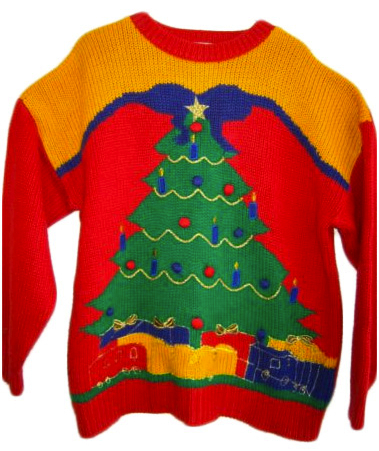 You know Christmas is coming, we are talking about choosing a perfect Christmas sweater to attend to a happy ugly Christmas party! What, no ugly Chanukah sweaters? #1 is the best!! And it plays Jingle bells how could you not like it?? Yeah buddy!! I don’t know what older generation would wear number 3 because I am 62 and my grandmother would have made that sucker sleep outside. Well, jeez, I like the cat sweater. My taste must be even worse than I thought. no sweater is ugly if it can keep you warm in the winter. 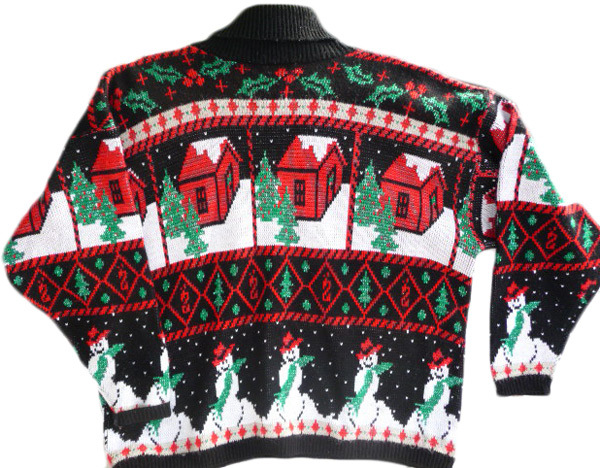 the only ugly sweater is the one not keeping you warm on a nice winter day. 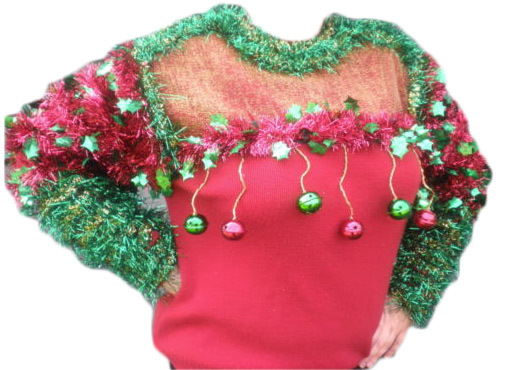 Ugly Christmas sweater #1 is flipping AMAZING! I found some good ones for 2017 already at https://www.ugly-sweaters.com but nothing like that! “ ” My love for blinking lights and knobs and sliders started really young.